Star Trek Discovery reimagines or redefines many staples of Star Trek. 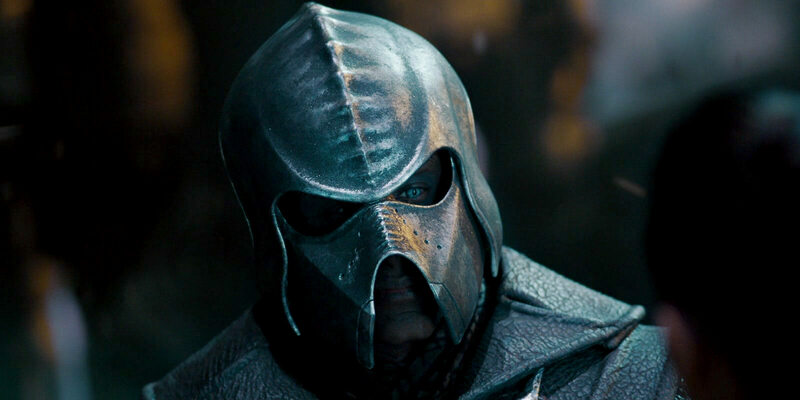 The total redesign of the Klingons is the arguably most dramatic among the many deliberate visual changes in the series. The species doesn't only lose the hair, but essential features of the Klingon body look totally different than the established appearances of TOS Klingons or TMP Klingons. In addition, their whole styling and technology, including starships, architecture, equipment and clothing, was altered beyond recognition. Considering that its creators tell us that Discovery takes place in the Prime Universe, it is not possible to simply overlook the radical visual alterations made for the series. Without an official blessing, it is not possible for fans to dismiss Discovery and slap a "total reboot" or even a "non-canon" label on it, even if it is effectively a reboot and disregards essential parts of the canon. 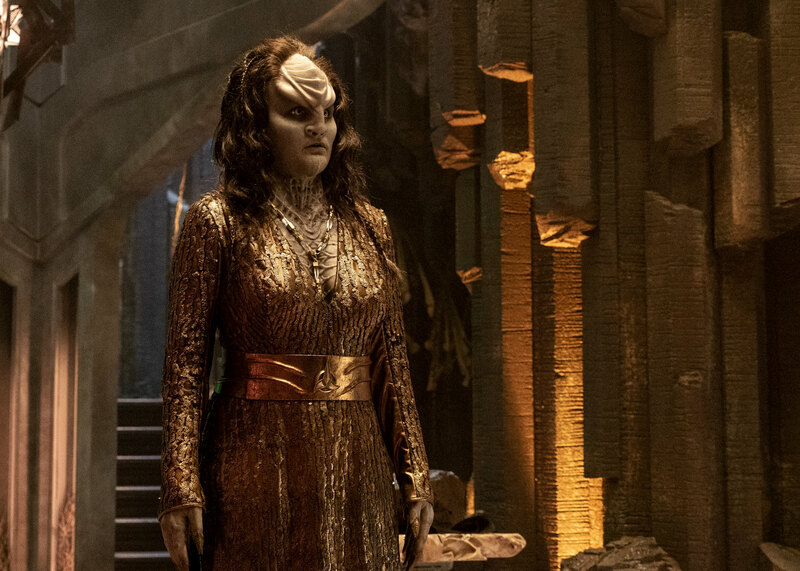 So even though much about Discovery feels wrong (not to say *is* wrong), EAS has to take care of issues like the Klingon redesign in some fashion. However, that still doesn't mean that EAS will cobble together speculative theories to make Discovery fit with canon. The producers as well as some fans argue that the Klingons were changed before, when the so far human-looking make-up of TOS made way for the TMP appearance with the forehead ridges. And even the TMP Klingons were not totally visually consistent, so some don't think it is a big issue if everything is changed yet again. Many pretend that the new DIS look is close enough to the old (TMP) look, the only real difference being the lack of hair. 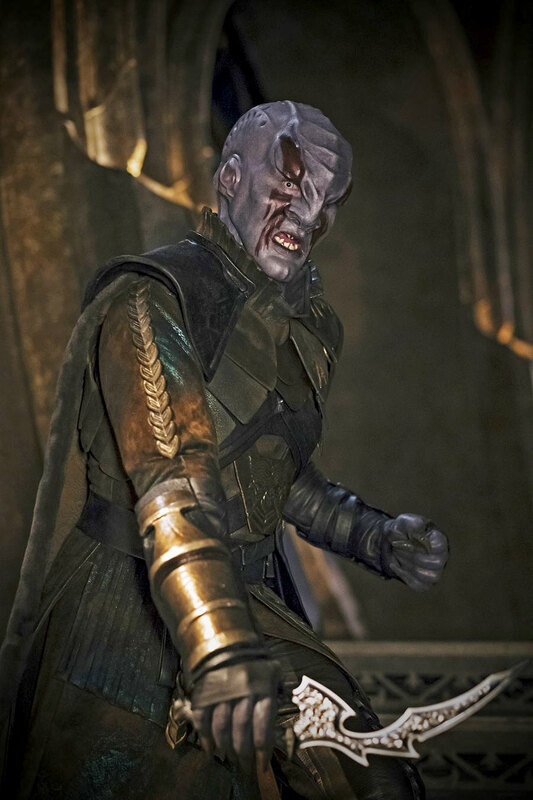 Another rationale brought forward is that the DIS Klingons, and particularly the House of T'Kuvma on their sarcophagus ship, could be a so far isolated sub-species of the Empire that for some reason becomes powerful in just one decade, only to vanish again or to undergo a mutation, although this almost definitely won't be addressed in Discovery. It is often cited as an explanation for the new look that there are 24 Klingon houses with different looks, although all Klingons of the series are "new" ones. 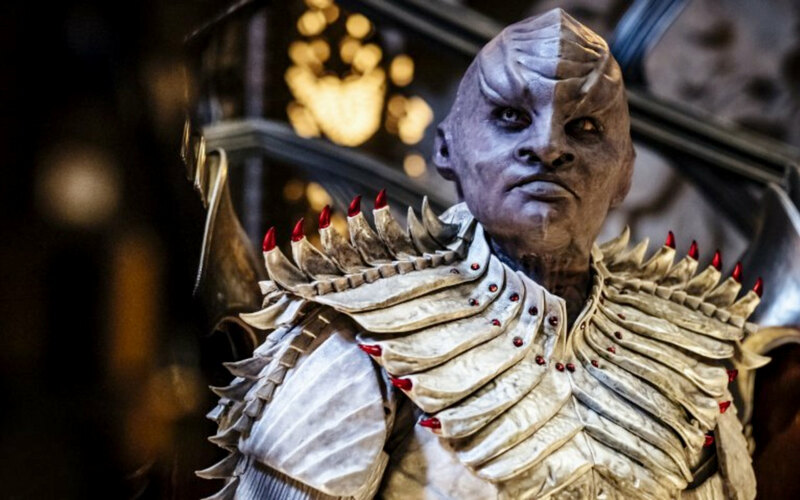 Make-up FX designer Glenn Hetrick defended the new Klingons, calling the redesign an "evolutionary imperative", based on the assumption that the species is a "cross between reptilian and avian". But he ignores that the Klingons were always mammalians, and shouldn't "evolve" to birds or reptiles, not in an artistic and much less in a biological sense. Finally, a drawing of a hairless Klingon with an exoskeleton by Robert Fletcher for TMP was unearthed as a rationale for the redesign, as if a pre-production sketch discarded 40 years ago suddenly overruled the canon Klingon appearance in more than 400 episodes. Speculation and wishful thinking doesn't help to make sense of the DIS Klingons, so let us stick with the facts. The following analysis shows how much the Discovery Klingons were changed and whether or not it could be possible to make them fit with canon. Between 2154 and approx. 2271, because of genetic treatment against augment virus, as shown in ENT: "Divergence"
TOS, DS9: "Trials and Tribble-ations", ENT: "Affliction", ENT: "Divergence"
All Klingons until 2154 have ridged foreheads. "Divergence" insinuates that Klingons would pass on the human traits including flat foreheads after the genetic treatment. For obvious reasons, all Klingons in TOS were affected by this genetic mutation still 110 years later. So the mere statistics tell us the flat forehead was the regular Klingon look at the time, although retroactive exceptions may be allowed. All Klingons since 2271 have ridged foreheads. Depiction of Kahless as a "flathead" in a fake scenario in TOS: "The Savage Curtain"
Given the statistics of TOS and TMP Klingons, the appearance of the STID Klingons itself is an anachronistic exception (but one that is easy to accept). The appearance of the DIS Klingons is more than an anachronistic exception, it is more like a definite canon violation. Elongated (adults), human (children). In DIS: "Magic to Make the Sanest Man Go Mad" Mudd explicitly refers to them as "pointy headed bastards". Update In season 2, the head shapes remain the same, we can still see some Klingons with extremely long heads. Only L'Rell's head was noticeably shortened. Central ridge and lateral ridges, many variations regarding the width and height and the patterns of the ridges. Related Klingons have similar ridge patterns. The Klingons in TMP may have just the central ridge. Central ridge and lateral ridges, same basic pattern but more "elaborate" than most TMP variations. More like an unevenness of the skull, plus the familiar three pronounced ridges. Overall similar as on some of the TMP variations. Only slightly pronounced, if any. Almost all TMP Klingons have hair, so the question was rather irrelevant so far. Yes, running down the nape. According to background information, the ridges hold sensory organs and have to be exposed. Update The notion of the sensory organs makes no sense, if they would be normally obstructed by the hair. Yes, except for some few Klingons such as Chang who either suffer from hair loss or simply shaved it off. Yes, at least a few of them have hair or beards protruding from the helmets. Update In season 2, most Klingons suddenly have hair or beards. The official explanation is that Klingons normally have hair but completely shave it off during a war. Pronounced. The DIS make-up includes cheek prosthetics. Pronounced. The DIS make-up includes chin prosthetics. Claw-like fingers. In DIS: "The War Without, The War Within" Tyler mentions how they shaved down Voq's finger tips to look human. Human, varieties from Caucasian "white" to dark brown. Some played by "blackfaced" Caucasian actors. Human, varieties from Caucasian "white" to dark brown, and albinos. Pitch black, brownish, pale beige, gray, and albinos. Overall many non-human-like varieties. 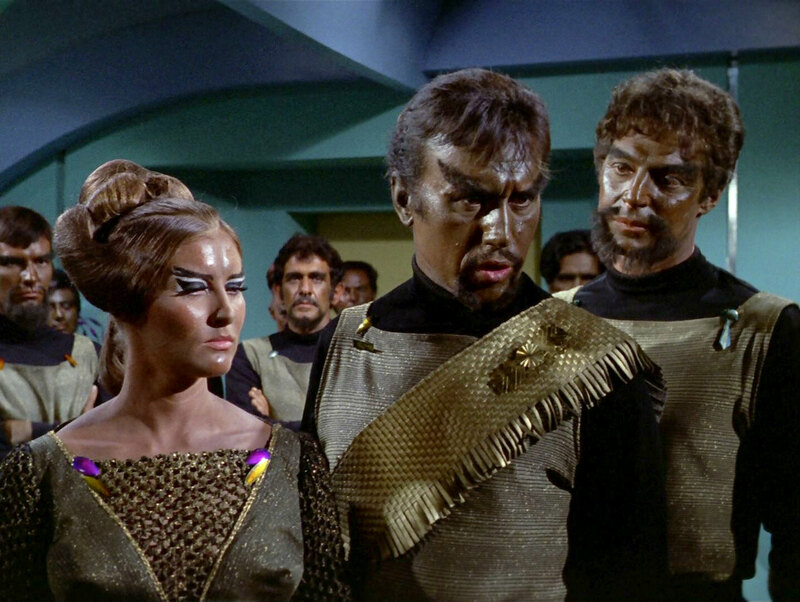 TOS and TMP Klingons share many traits, but not more than most other humanoid races. The visual discrepancy exists since TMP. It was commonly ignored until it was explicitly hinted at in DS9: "Trials and Tribble-ations", and explained in ENT: "Divergence". The statistics do not support it, but the retconned history would allow TOS and TMP Klingons to appear side by side at any time between 2154 and 2271 and possibly later. The STID Klingon could pass as a TMP Klingon, rather than as a DIS Klingon. 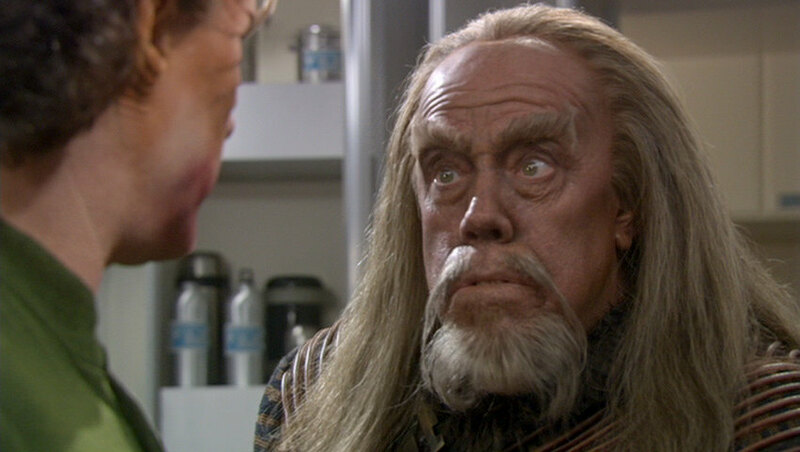 The Discovery Klingons look much more alien than any previous variation. If any "classic" Klingons should ever appear in Discovery, it may be allowed to seek an explanation, but it would be a lot harder and more far-fetched than the one from ENT: "Divergence". 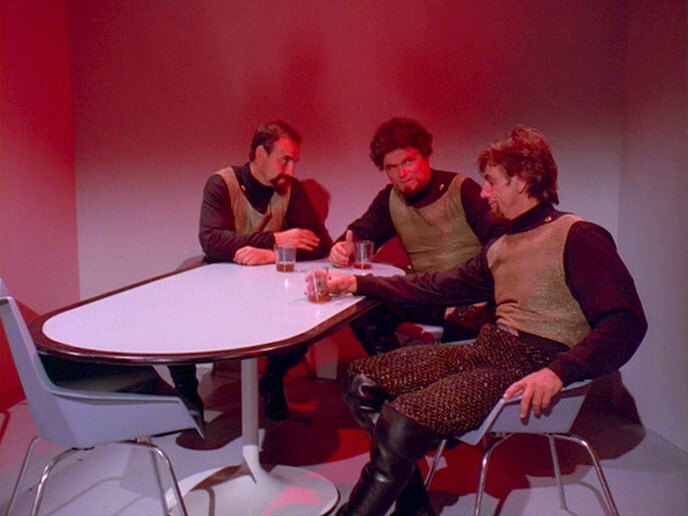 If the DIS Klingons remain the only Klingons of the series, it is factually a total (visual) reboot with no continuity ties to the existing Star Trek. We may want to add to the list that Discovery Klingons are unwieldy, compared to any of their predecessors of classic Star Trek. They also speak slowly, and with distorted voices. In a revision of the revision, the Discovery Klingons get back their hair for season 2, apparently along with make-up changes to make them more relatable again. L'Rell even loses a third of her skull volume, but this particular change remains an exception. Other "long-headed" Klingons can still be seen in season 2. The growth of hair is explained in DIS: "Point of Light" as a tradition after the end of a war, as previously suggested by Mary Chieffo at New York Comic Con. The previous idea that there are sensory organs that must not be covered with hair is definitely obsolete now. L'Rell 1.0 in DIS: "The Butcher's Knife Cares Not for the Lamb's Cry"
L'Rell 2.0 in DIS: "Point of Light"
The notion that all Klingons without exception are bald during a war is absurd, considering that classic Klingons were more or less always at war in the 22nd, in the 23rd and in the 24th century and all of them always had hair (the only exception being General Chang). All Klingons of the different houses of Discovery, in contrast, had no hair even before T'Kuvma made the surprising suggestion to go to war against the Federation. Klingon children had no hair in T'Kuvma's flashback, and Mirror Voq was hairless as well. Perhaps the political changes brought about by L'Rell are the actual reason why Klingons grow hair again and never give up this custom again. But this conflicts with the uninterrupted continuity of classic "hairy" Klingons, and quite paradoxically Discovery postulates that the Klingons have totally conformist traditions at a time when they are said to be totally divided. In any case, those Discovery Klingons must have amazing razors! The beginning of the 100-year isolation of the Klingons mentioned in DIS: "The Vulcan Hello" corresponds to the time of ENT: "Divergence" when the Klingons began to mutate from the TMP to the TOS look. This period (in which no human has seen any Klingons?!) may serve as a loophole to explain the new mutation in a future episode. We should rule this out from the outset because the frequency of changes is so obviously ridiculous, even if it may not be a hard rule that all Klingons underwent all stages of the many metamorphoses. Where is the amazement about the new Klingon look? Burnham is just unfamiliar with the Torchbearer, but no one seems to have a problem with T'Kuvma's appearance. 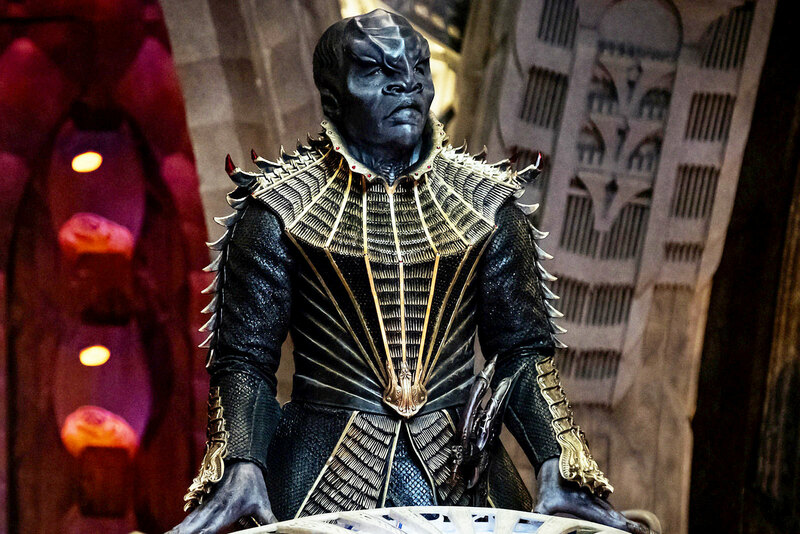 Also, would T'Kuvma's people celebrate their current, mutated state as the "pure" Klingon appearance? Totally unthinkable. If they are mutated, wouldn't the Klingons at least want to keep their hair? We see only T'Kuvma and his closest allies in Discovery. They all share the rare traits, while the majority of Klingons are what seems to be a minority in Discovery. This theory would necessitate the appearance of a sufficient number of "old" Klingons in the series besides T'Kuvma's alleged sub-species, but Discovery doesn't show any. The 24 other houses all share the look of T'Kuvma's. There are some variations regarding the skull shape, but none that looks like an "old" Klingon. The main distinguishing mark is the styling (less heavily decorated costumes and weapons than T'Kuvma's house, for instance, and different hairstyles since season 2), rather than the biology. 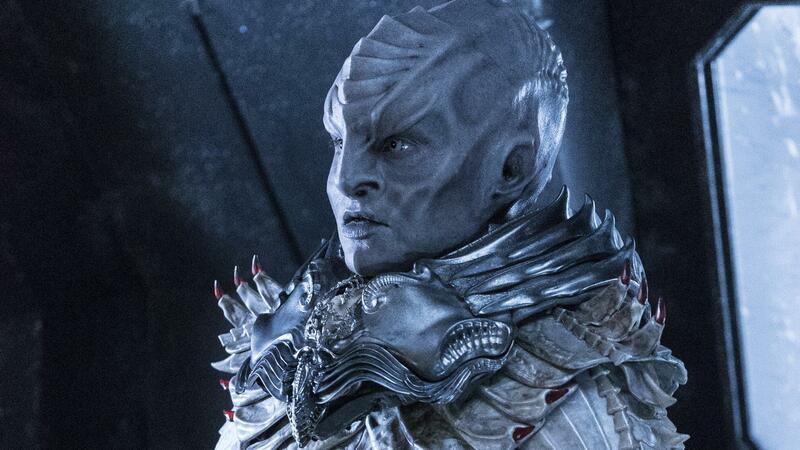 The gray-skinned DIS Klingon Kol is a member of the House of Kor (and an enemy of T'Kuvma). We can take for granted that this is the same house that Kor of TOS: "Errand of Mercy" belongs to. 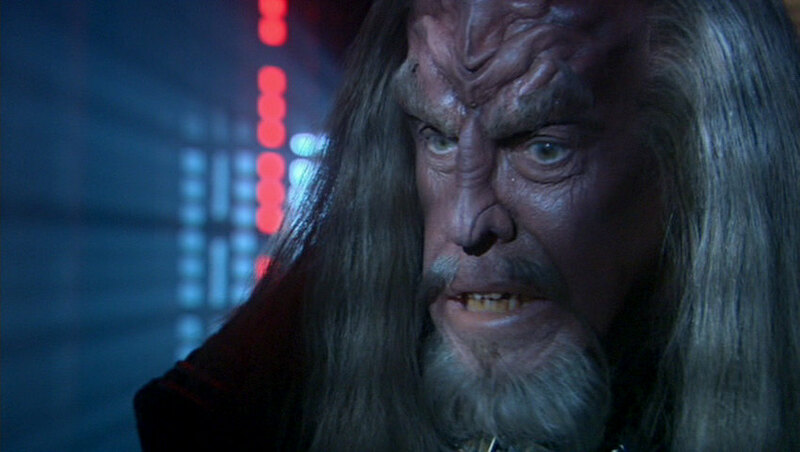 Kor underwent a metamorphosis (back) to his original Klingon look between TOS and his appearances on DS9. Could his relative Kol (and his father Kol-Sha) belong to a still completely different looking sub-species? Very implausible. Where were the DIS Klingons before DIS and where will they go after DIS? It may have to do with the sub-species being isolationist, but in season 2 it becomes apparent that even on Qo'noS they are the only type of Klingons to exist. The DIS Klingons would not simply disappear without a trace, and with never being referred to again. The official policy, as by the repeated affirmations of the producers, is that Discovery is set in the Prime Universe and adheres to canon. If this is true, they have exempted visuals from canon, so Discovery is a reboot, but "only" on the visual side. In other words, we have to imagine that all Klingons always looked like in DIS. The return of their hair in season 2 is supposed to make the acceptance of the official policy easier but raises even more questions. The Klingon look of TOS was already iconic when TMP was produced. Many fans, as well as many people working behind the scenes, would have been upset if TMP had invalidated the look of TOS, even though it was the obvious choice for many years. Then DS9: "Trials and Tribble-ations" came along and set a standard: Visuals must not be ignored. If Klingons looked different in the past, so be it. If that doesn't fit with canon, we can and maybe have to try to corroborate its canon status, in this particular case with the ENT double feature "Affliction" and "Divergence". Not everyone may like this retcon, but it is how Star Trek used to work. Do we want Worf to look like in DIS? Or any other prominent Klingon? Even with hair that would be unthinkable. Michael Dorn more or less ruled out that he would ever want to wear such a thick make-up that doesn't allow true acting. Hybrids like K'Ehleyr and B'Elanna may not even exist, seeing how non-humanoid the DIS Klingons are. In TNG: "Birthright II", Worf discovers that Ba'el has pointed ears, unlike the other Klingons, because she is a Klingon-Romulan hybrid. This plot point would be invalidated if all Klingons have pointed ears anyway, and much more alien than either humans or Romulans. 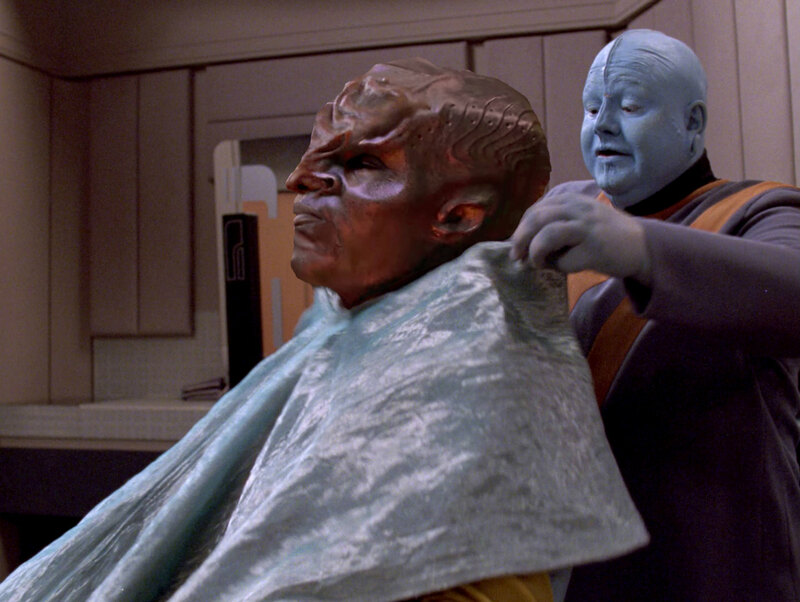 As already mentioned, it makes no sense for Klingons to shave all their hair (and beards) during a war because they are a warrior race that is more or less always at war. The canon story of the ENT episodes "Affliction" and "Divergence" would be rendered absurd, as we would have to see in our minds something very different than what appears on screen. Since it is unbelievable that the DIS Klingons could profit from human genes and might mutate to human-looking Klingons, perhaps it would be better to abandon this whole ENT story, and ultimately the whole idea of human-looking TOS Klingons. Discovery would effectively become an incompatible reboot, not only visually. Mudd's description of the new Klingons as "pointy headed bastards" further corroborates their different look and jeopardizes the idea of a visual update we may be able to ignore. Well, that is a conclusion we may draw for ourselves. But it is not supported by the official canon policy, which dictates that Discovery is "only" a visual reimagination. Summarizing, Discovery fails to do two substantial things to justify the total redesign of the Klingons: give us a sufficient number of "classic" Klingons, and serve us some explanation why key figures of the Empire of the 23rd century (and their ships and styling) don't look familiar at all. 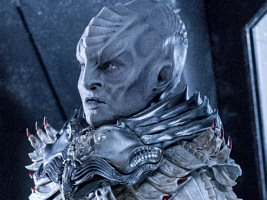 The series has chosen to show only Klingons that look like T'Kuvma, L'Rell and Voq, by which Discovery implicitly declares itself a (total or visual) reboot, irrespective of all affirmations to the contrary. The Klingons get back their hair in season 2, but this is only a visual bridge to make them a bit more relatable. Visual continuity has always been a quality mark of Star Trek, and an important part of its canon. With the extreme redesign of the Klingons and of everything related to them (such as the starships), Discovery has abandoned this longstanding principle. The purported reason is that the producers of the series wanted to appeal to a "modern audience". But does this mean a total reboot was inevitable? It is clear that Discovery couldn't have been made with the crude visual effects of the 1960s, with sets consisting of colorfully illuminated walls and with moustached TOS Klingons. There are wonderful fan-made TOS revivals such as Star Trek New Voyages and Star Trek Continues, but hardly any fan would honestly demand from a modern TV series to look like that (although this is a customary strawman used in an attempt to discredit my actual position). In fact, we already have an awesome and well-established Klingon make-up and styling since "Star Trek: The Motion Picture". There was nothing wrong or dated about the iconic look of the TMP Klingons and about their almost equally famous ship designs, like the D7/K't'inga or the Bird-of-Prey. They used to be the arguably most recognizable aliens of any science fiction series. 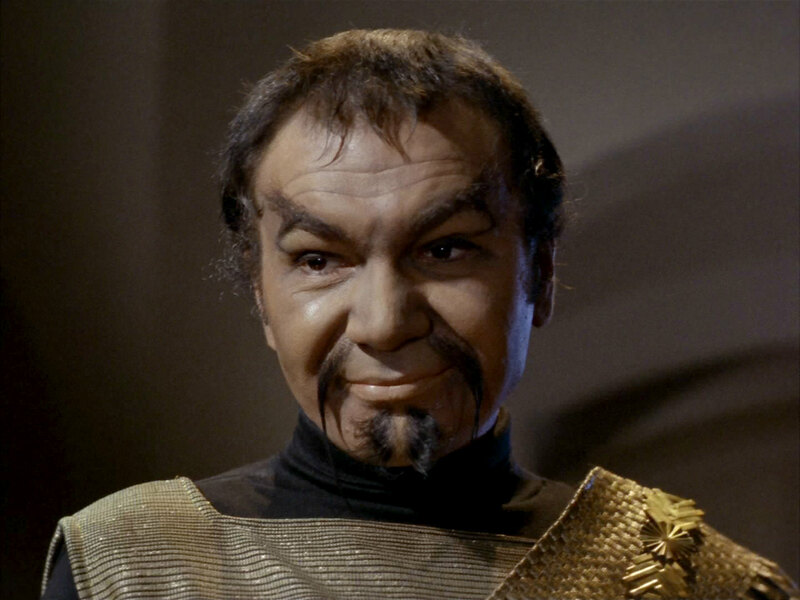 Even casual fans and people with otherwise no ties to Star Trek were fond of the Klingon looks. Still, the makers of Discovery decided to throw this legacy away. They replaced our beloved Klingons with a clumsy race that is barely capable of clear articulation and whose styling is ridiculously overblown. They turned one of the most formidable sci-fi civilizations ever created into a pseudo-religious xenophobic sect with foolish leaders. 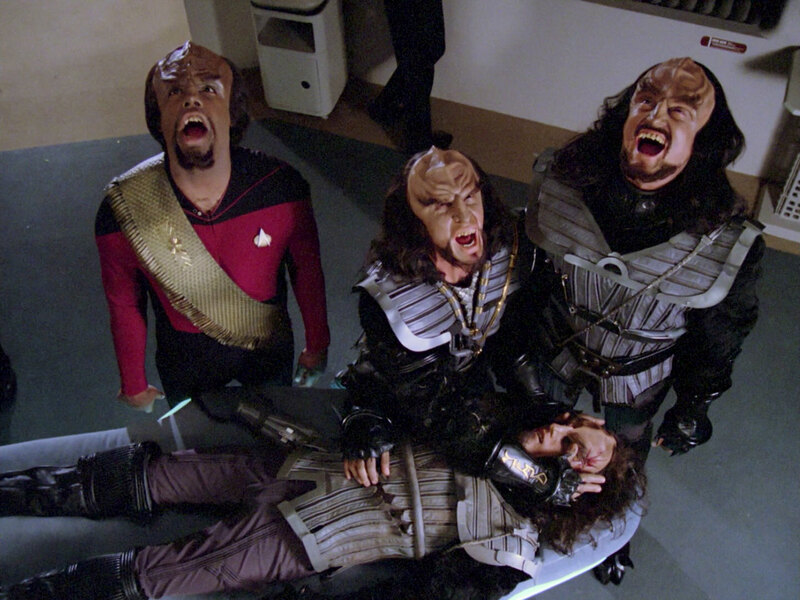 I could feel a little bit better about the unwarranted redesign of the Klingons if it were successful. The USS Enterprise NCC-1701 suffered the same fate in Discovery, but the visual reboot of the ship in "Will You Take My Hand?" is at least aesthetically pleasing and still looks like an Enterprise. In contrast, everything about the all-new Klingons is just appalling. It is true that Star Trek had plenty of inconsistent visuals already before Discovery, and few people have cared more for them than me. But with the new Klingons and some other questionable design decisions the makers of the series cross a line. We're not talking about the Trills, a race that appeared just once on TNG before it was decided to alter their appearance for DS9. We're not talking about make-up updates thanks to new techniques, like the moving antennae of the Andorians on Enterprise. We're not talking about something that may ever make sense in canon or only in our headcanon, like the previous changes to the Klingons. Discovery is and will always be visually incompatible with everything that came before. The visuals are one of several aspects in which Discovery is Star Trek in name only. Discovery does not try to extend the painting the way that all previous series did, including Enterprise. It paints all over the canvas of the existing Star Trek. Setting the series in the 2250s was the first big mistake because canon problems are inevitable once new stories are shoehorned into an era that is already taken by an old series. It is odd how the producers themselves lament this setting as if they didn't anticipate the problems (Discovery being the third prequel in a row). The second mistake, the visual redefinition, may have been more tolerable in a series set in an unclaimed era, and preferably in the future. It may have even been possible without any harm to the old Star Trek. Imagine Discovery were set in the 25th century and the new aliens are no Klingons but a race not yet encountered. The story could be still the same; only the token nostalgia, such as the character of Sarek, would have to be removed to that end. With its actual setting, however, the series only adds insult to injury in a "historical" in-universe context. It is like the redesigned Klingons, ship designs, clothes and interiors speak to us, saying that the look of the old Star Trek was crap and that only the latest visual update is endorsed. I don't want to imply that the Discovery producers and production designers hate the style of the pre-existing Star Trek and wanted to get away with it at any rate. They may have done their best to make the design of the series work for themselves. But whatever their self-perception is, they totally failed to pay the old Star Trek the due respect. From now, watching the old Star Trek with the old Klingons is impaired by the knowledge that the manufacturer has ended the support for this legacy product. 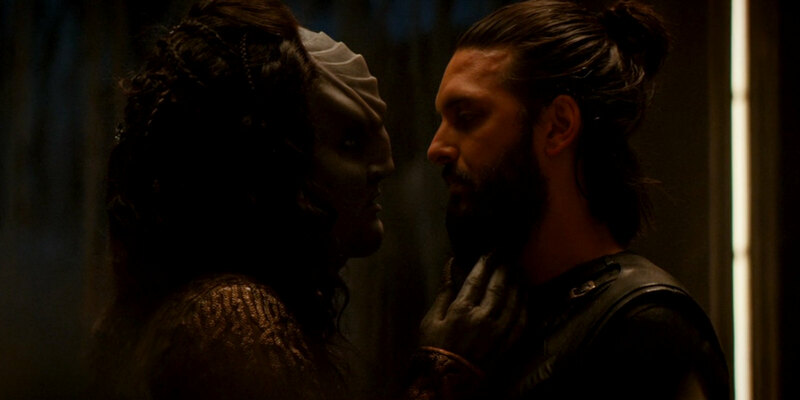 It is good that the Klingons get back their hair in season 2. While this is only a small step on a very painful way to reconcile DIS with classic Star Trek, it shows that the people in charge listen to justified complaints and are willing to revise at least the worst errors of the series. Yet, I would have preferred a series that wouldn't make such glaringly obvious errors in the first place. Thanks to Chris for the hint about the STID Klingons with hair and to Charles Eavenson II for the mentions of Klingon hair and claws, as well as the observation about the "reptilian ears".